Many people spend hours and hours in the gym because they believe that this is best way to get into shape. To a certain extent it is, however, there are a number of reasons why you may want to incorporate hiking or walking into your exercise regime. Let’s take a little look at a few of these reasons.As you can probably guess, hiking and walking are cardiovascular exercises. This means that this exercise gets your heart pumping and your lungs working. As a result, it will have a much greater effect on reducing heart disease and the chance of heart attacks. You will not get this same sort of benefit by weight lifting alone. Walking is also fantastic for relieving stress. If you choose to walk in a beautiful area, you won’t even know that you are exercising! Walking is well known for releasing some of the ‘feel good’ chemicals such as adrenaline and endorphins. These help to boost your happiness levels, and of course make you feel less stressed. When you’re feeling over worked and stressed out walking can help clear your head while at the same time incorporate exercise into your busy day. It can also be a social activity. You can go out walking with your friends and use that time exercising to catch up and trade stories. 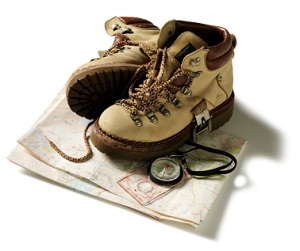 Just like running clubs you can also find walking or hiking clubs in your area. Joining these clubs is a great way to meet new people and improve your health. When you combine exercise with social activities it keeps you motivated to carry on with your exercise program. Improved Cardiovascular System, for example, your blood will flow better, heart will work more efficiently and your lungs as well. In short, you will be much fitter. Improved Muscles. Hiking is great for building up the muscles, and is a fantastic break from the gym. You won’t be putting your muscles under too much of a strain either. Combats various problems with the body. For example, the chance of type 2 diabetes, high blood pressure and high cholesterol. <li.One of the best methods for weight loss. In just an hour you can burn 370 calories, not a lot compared to some activities, but it won't really feel like a 'workout' and is a great starting point for people who haven't exercised before. Great for sleeping better. Studies have shown that those who regularly engage in hiking tend to sleep better at night. In order to feel the benefits of hiking or walking you don’t really need to devote much time to it. All that is required is around 30 minutes a day for five days of the week. Surely you can manage that amount of time? Trust me, incorporating hiking into your exercise regime could perhaps be one of the best decisions that you have ever made. This entry was posted in News Magazine and tagged exercise, exercise regime, fitness, hiking, walking on November 1, 2012 by admin. The service of Assured Lease Corporation was exceptional. They are able to design leases that are specific to our needs.